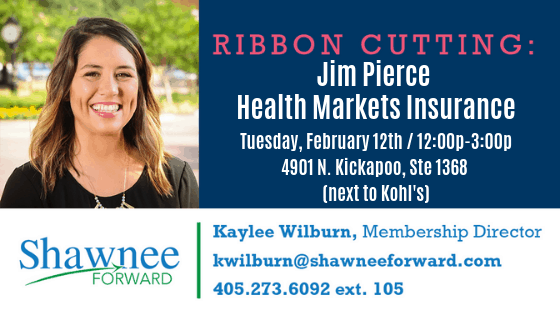 Join us for the Grand Opening and Ribbon Cutting of Jim Pierce Health Markets Insurance Tuesday, February 12th from 12p-3p at his new location! Shawnee Mall, Ste. 1368 (next to Kohl’s). Shawnee Forward is growing and we love celebrating new members with others in the business community! We think it is so important, especially for us life-long Shawnee residents to show up and show out when people invest in Shawnee by developing an area, opening a business, or bringing exciting new things to our community. Grand Openings and Ribbon Cuttings are not only for the pomp and pageantry, but give us an opportunity to be excited for and to support others who are spending their time and money to positively impact our area!